I had a few minutes to finish up my card for MIM tonight, before we head to Michigan to visit my family tomorrow. I certainly thought of the beautiful stained glass windows of Notre Dame, as I created my window from Mendhi Medallion. I remember the wonderful jewel tones of glass, depicting different things from the Bible. The richness of so much color, could never be duplicated, but I sure tried. Thanks for a great technique Betsy! Oh this is just beautiful!! I love what you've done with the challenge. Lovely! Beautifully done Luanne! Love your stamp choice and colouring for this challenge. Luanne, this is so gorgeous. Love your colors and this really looks like stained glass. Your card is absolutely beautiful, Luanne. Love the sentiment too. I love your card! It's just beautiful!! 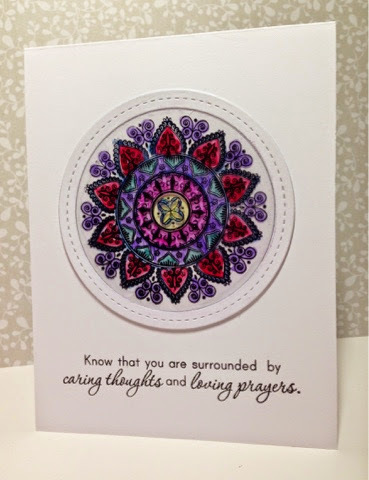 The medallion is a perfect choice for this technique and I love the colors you choose! Gorgeous, Luanne, and congrats on your MIM win! I didn't get a chance to attempt that challenge but keeping it on my radar.